Mobile is a fact of life. Our mobile phones are where we connect, communicate and consume content. 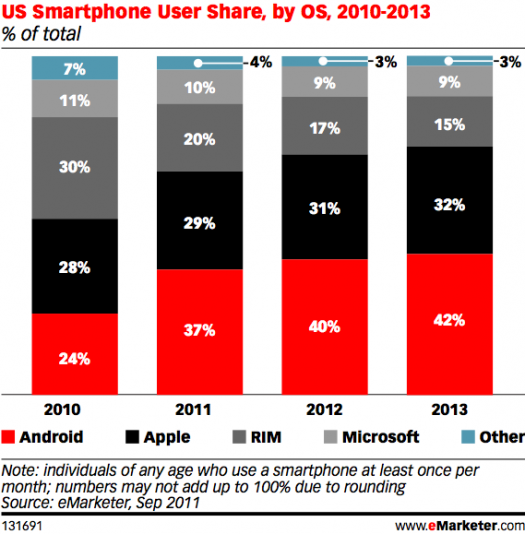 Mobile marketing in the US continues to grow at accelerated rates, fueled by increased smartphone ownership. 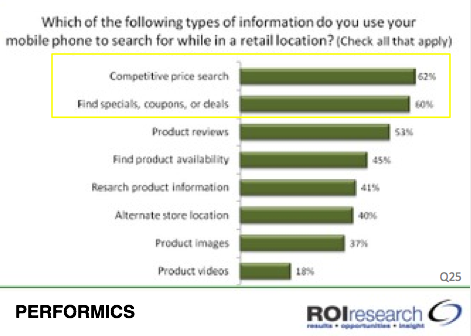 In addition to expanded communications and content consumption, consumers use smartphones to research and buy products and other services, often while in retail establishments, causing marketers to focus and allocate budget to this growing channel. 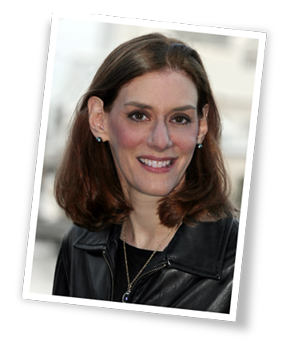 Here are thirty-eight charts and analysis to help you develop your 2012 marketing plans. A word of caution when using mobile marketing data, it’s important to check what’s being counted. Some sources incorporate tablets in mobile and other don’t. 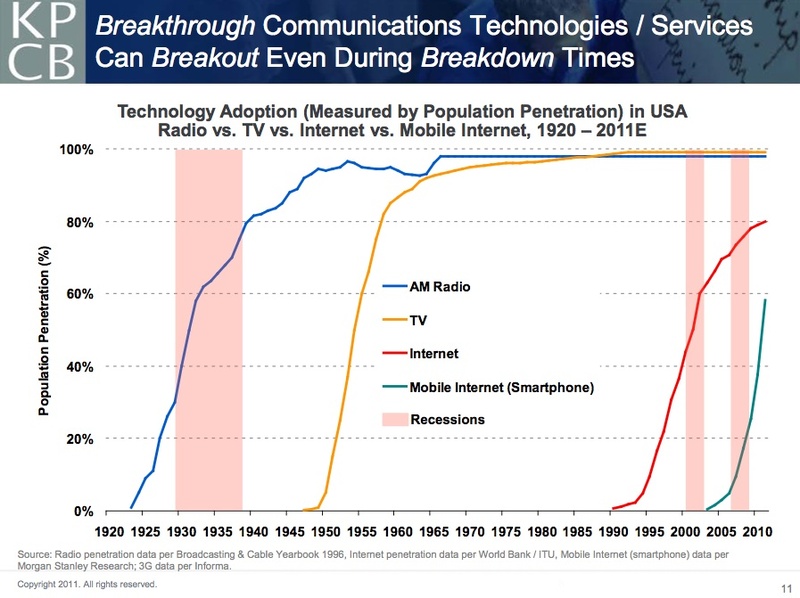 While still in its early stages, smartphone growth and penetration has been faster than earlier technologies, based on data presented by Mary Meeker in October 2011. Smartphones account for about one third of the US mobile phone market, based on comScore data. 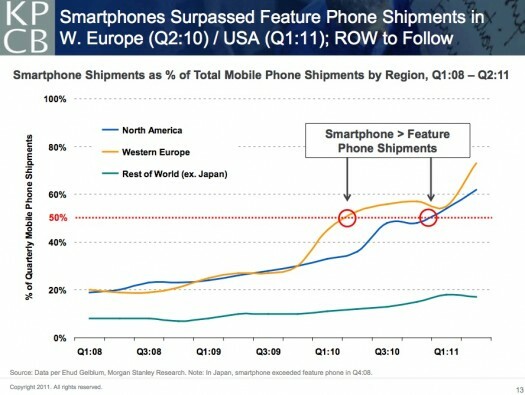 Smartphone shipments exceeded feature phones in the US in mid 2011. The Android operating system continues to increase share in the US, largely at the expense of RIM (aka Blackberry) according to eMarketer. 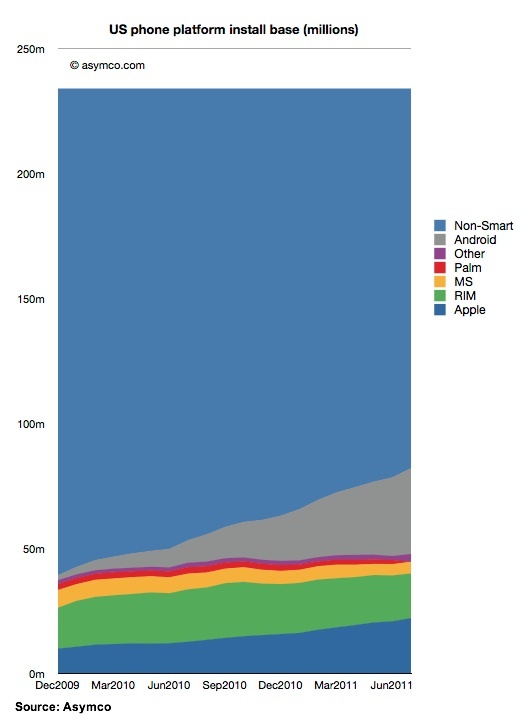 Here’s a visual of market share for the dominant smartphone brands in the US over the past few years via Asymco. While smartphones have experienced strong growth to-date, they have only one seventh of the total global mobile phone subscriber market. 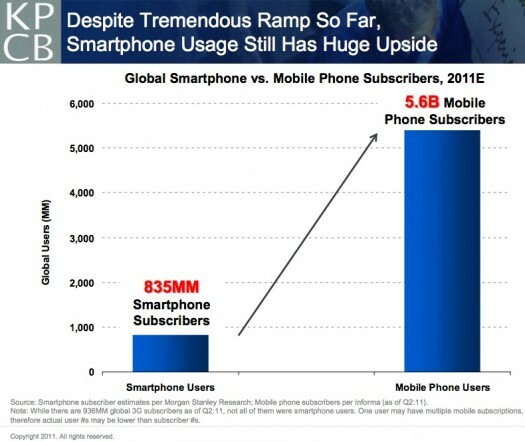 This translates to further growth potential for smartphone sales as this Mary Meeker graphic shows. To understand how smartphones have changed consumers perceptions, Exact Target asked what respondents would keep over their smartphones. 16% of teens would give up their car, the ultimate teen symbol of independence, before they gave up their smartphone. From a marketing perspective, it’s important to understand how and where consumers use their mobile phones. 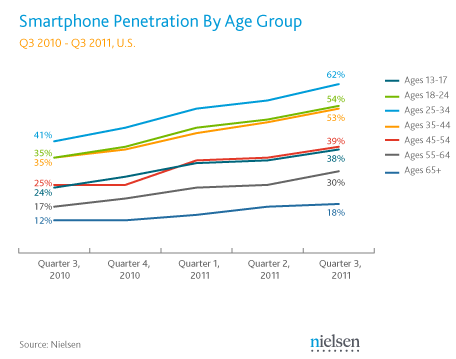 As smartphone penetration continues to increase, mobile phones are no longer just for talking. 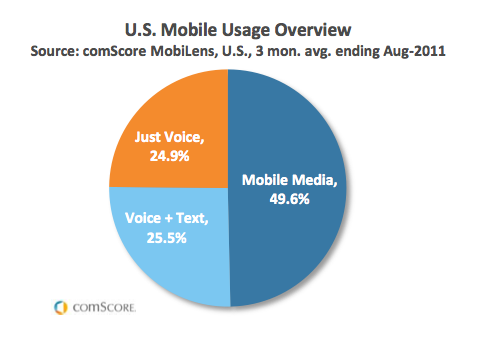 In fact, according to comScore, only one out of four owners use a phone solely for voice communications. 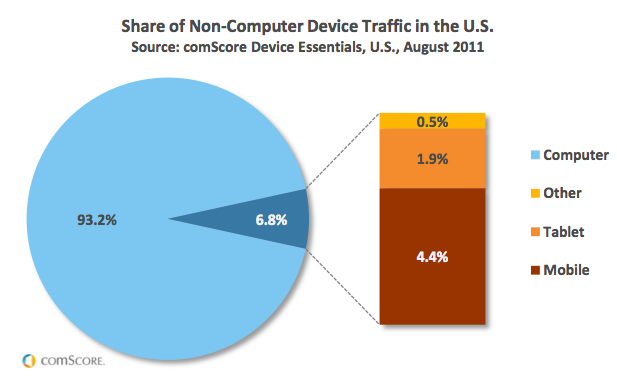 Despite the increase in smartphone ownership, mobile only accounts for 4.4% of US traffic, according to comScore. 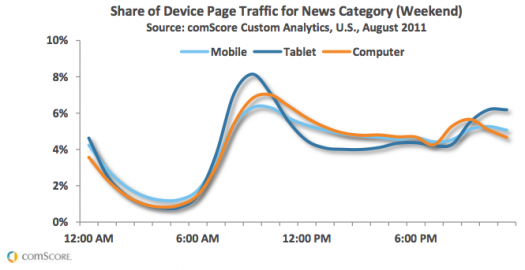 Interestingly, mobile page traffic follows a fairly consistent trend across dayparts as well as by weekday and weekend. This is in contrast to other devices, namely computers which tend to be used for work and tablets which tend to be used for personal activities. Since our smartphones are always with us, we use them for a wide range of activities. Despite Blackberry’s decline, the biggest smartphone activity remains email, especially when personal and work email are combined. When it comes to smartphones, location matters! 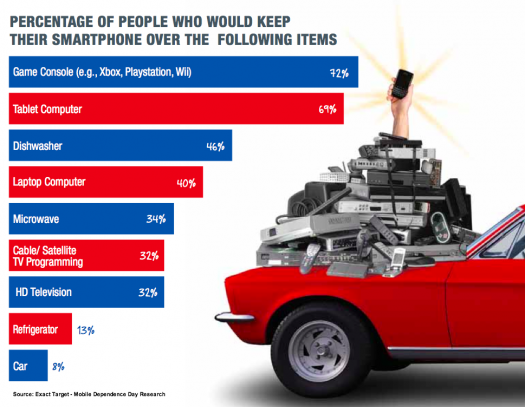 Where do we use smartphones? Hint: It’s NOT just on-the-go! Smartphone owners practice concurrent content consumption. 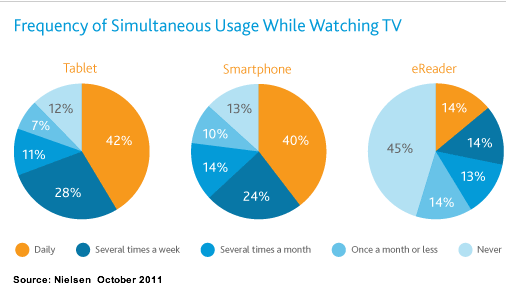 In fact, two out of five owners use their smartphone while watching TV daily, based on Nielsen research. What do owners do when they multitask? You guessed it—read email! 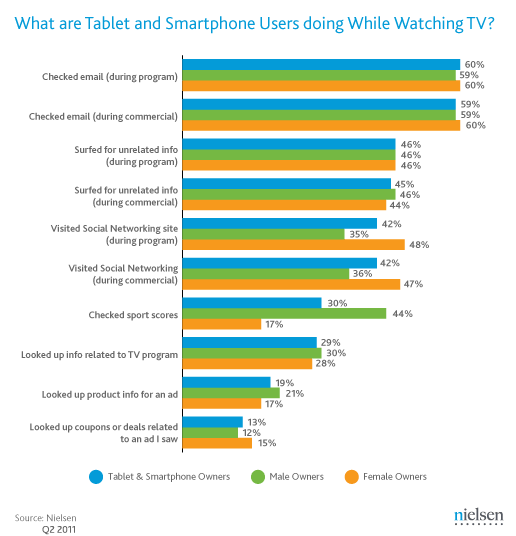 The good news for television advertisers is that 10-20% of those using their smartphones while they watch television checked for product information and/or coupons. Integrating mobile marketing into your overall plans helps support every phase of the purchase cycle, based on data from eMarketer via Millward Brown-Dynamic Logic. 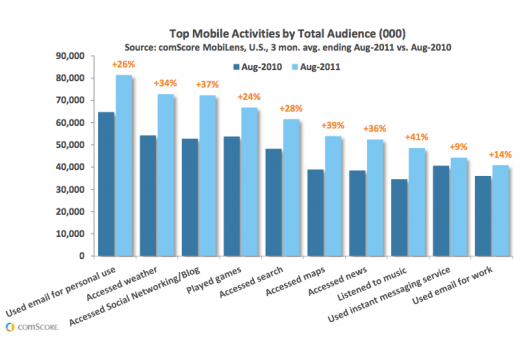 Are you ready to start your mobile marketing plans? 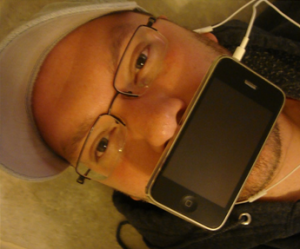 Here’s mobile marketing help. 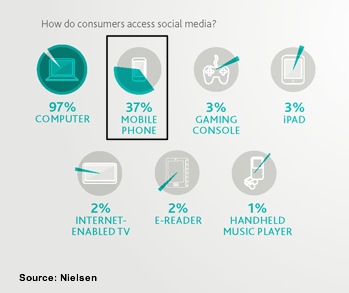 Mobile devices, particularly smartphones, aid social media usage according to Nielsen. Grounded in consuming, creating and sharing content with family, friends and social media connections, social media leverages mobile phones, especially smartphones, to facilitate these activities. It’s no surprise that Pandora has almost twice the mobile traffic of Facebook since listening to music is a heavily used mobile device feature. US mobile advertising will reach nearly $1.23 billion in 2011, an increase from $743 million in 2011 based on eMarketer’s latest forecast. Including display ads (banners, rich media and video), search and messaging-based advertising on both mobile phones and tablets, US mobile advertising market is projected to reach $4.4 billion in 2015. As marketers increasingly use mobile advertising to support their diverse, cross platform plans and multi-channel purchasing, their mobile campaign goals continue to evolve. 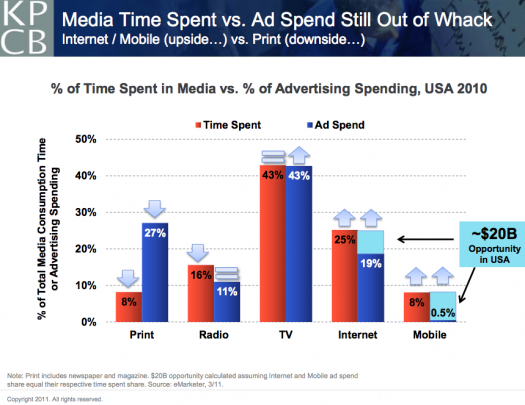 About one third of mobile advertising aims to support market presence. While this is obvious for marketers with a local retail establishment, the need is less clear for online-only merchants. The surprise in this chart is the relatively low proportion of advertising to drive foot traffic when shoppers turn to their phones to find stores, restaurants and entertainment. Although it’s possible that this is compensated for by mobile websites. In October 2011, impressions from Millenial Media’s platform were distributed as follows: 71% of came from smartphones, 15% came from feature phones, and 14% came from connected devices such as tablets, MP3 players and e-readers. Mary Meeker projects increased opportunity for Internet and mobile advertising since time spent with these devices is out of alignment with the marketing spend. 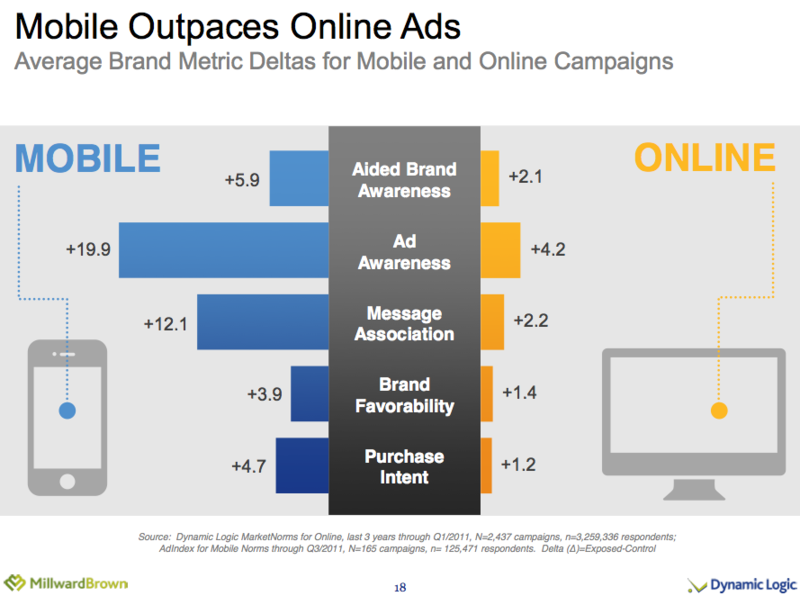 Mobile advertising helps build brands based on research by Millward Brown/Dynamic Logic. 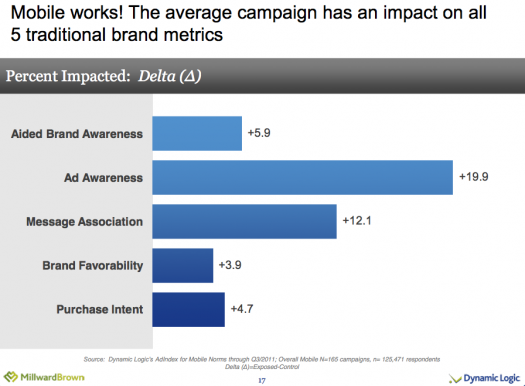 It works across the five traditional brand metrics: aided brand awareness, ad awareness, message association, brand favorability and purchase intent. 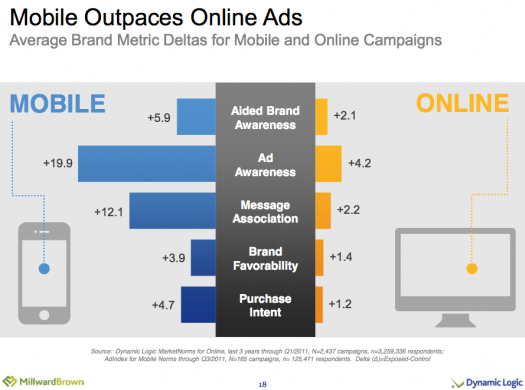 Further, research shows that mobile advertising yields stronger branding results. 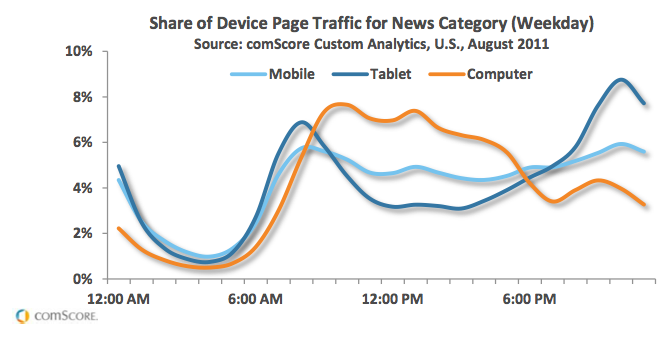 Marketers should note that this may be attributable to increased attention to the newer device / format. When examining mobile advertising, don’t underestimate the value of cross platform exposure. 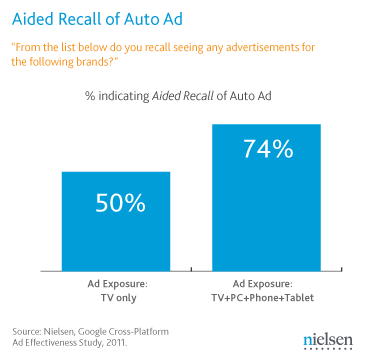 Nielsen research showed a significant increase in aided advertising recall. In Q32011, about one out of five mobile advertising campaigns on Millennial Media’s network enabled users to take a social media action such as like a brand on Facebook or provide product feedback. As the US mobile advertising market continues to grow and mature, banner and rich media advertising, search and video will grow at accelerated rates relative to messaging. 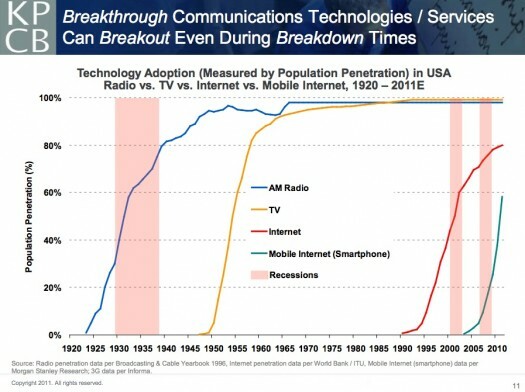 The result is that messaging will be a smaller portion of the total mobile advertising market. With the expansion of mobile advertising options, a range of diverse verticals has increased their mobile usage across the breadth of product offerings not just those to fulfill local or on-the-go needs. It’s interesting to note the dominance of finance. This is most likely attributable to the time-sensitive nature of financial service offerings and the revenue potential of non-banking financial products. Since the growth rate of mobile advertising verticals is driven by their relatively small spend in the base period, it shows a rapid increase. 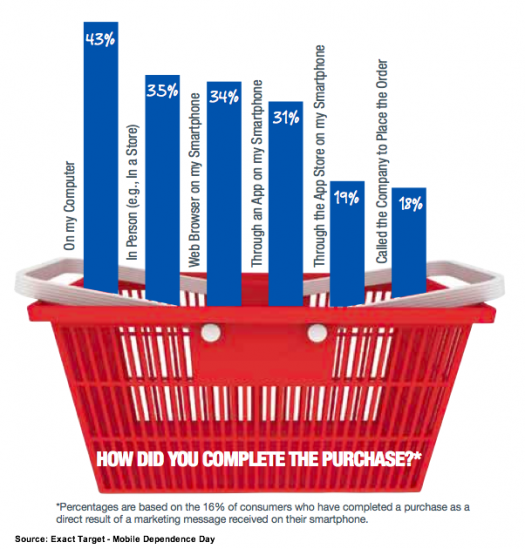 This chart reveals significant budget increases in mobile advertising by technology and CPG marketers. Of note is the fact that long time users of mobile media, local retail, restaurants and entertainment continue to increase spend in this format. Local market targeting has expanded significantly. 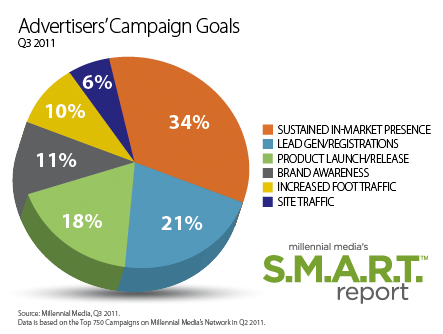 In 3Q2011, two thirds of every targeted audience campaign used local market targeting based on Millennial Media data. 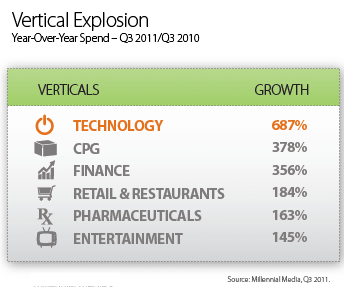 From 1Q2009 to 2Q2011, local market targeting increase 20 fold. As a form of mobile advertising, mobile search differs from web based search and it’s a growing category. 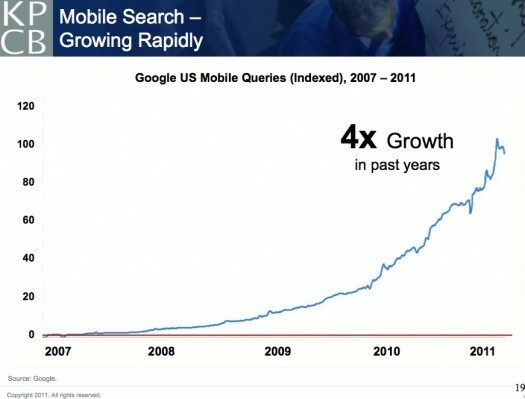 In part, this is attributable to the fact that mobile owners find search an easy way to navigate the web. Google’s mobile search queries have quadrupled in the last four years. 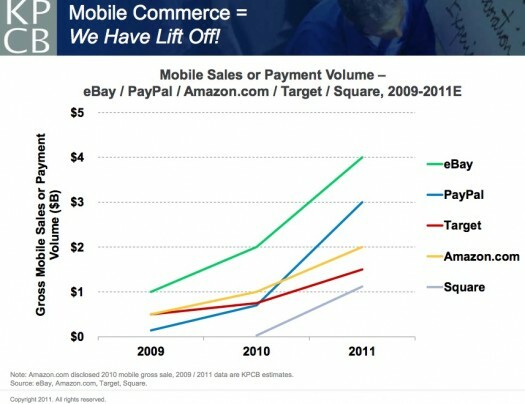 US mobile commerce is projected to reach $6.7 billion in 2011, a 91.4% increase over 2010 and to increase another 73.1% to $11.6 billion in 2012 according to eMarketer. 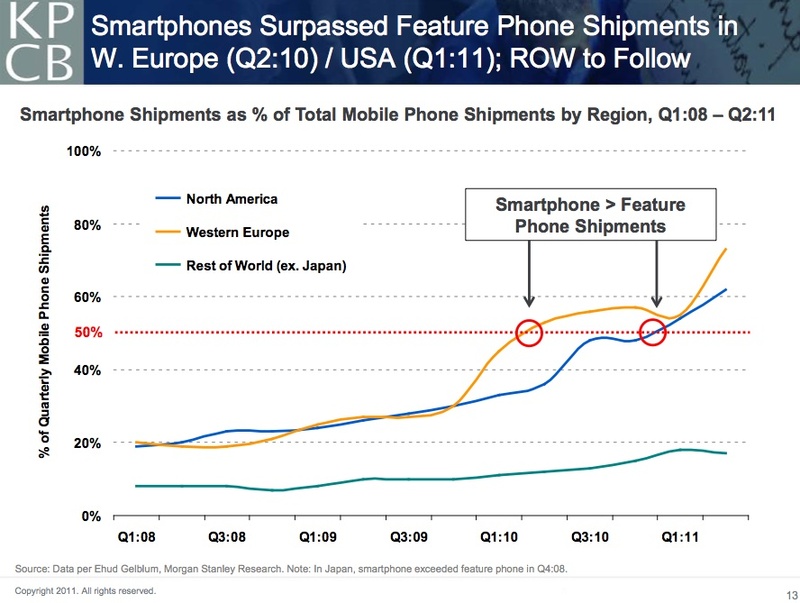 These forecasts don’t include sales made via tablets. 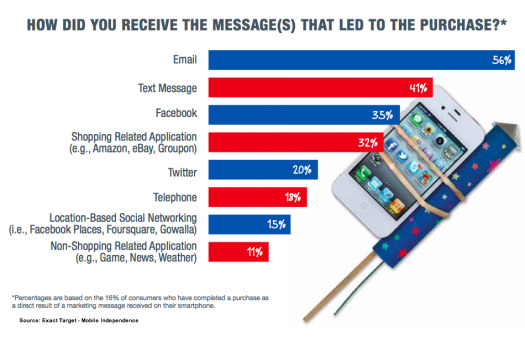 What prompts consumers to buy via their mobile device? For over half of Exact Target respondents, it’s email. 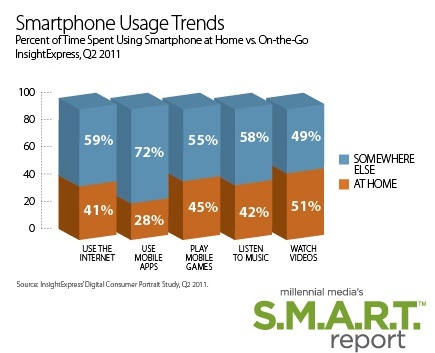 No surprise, since it’s where smartphone users spend most of their time. 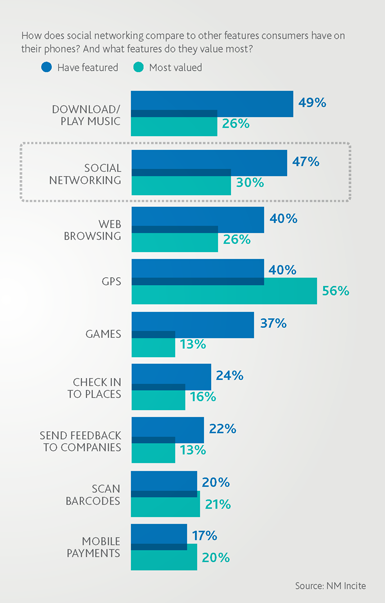 For consumers, mobile usage at retail is mainly about saving money. (BTW, the same consumer mindset exists on other channels. In part this discount-orientation is attributable to the weak economy.) They’re looking for competitive prices and discounts. To this end, marketers should consider offering competitive discounts via mobile or you risk losing customers to other merchants who have them. Don’t forget to ask for their mobile contact information while you’re at it! But don’t assume that, because shoppers connect with your business via a mobile device, that’s how they want to close the deal. About one out of three customers chose to shop in-person. Since buyers varied in how they wanted to pay, it’s important to give your shoppers a choice of purchase options. 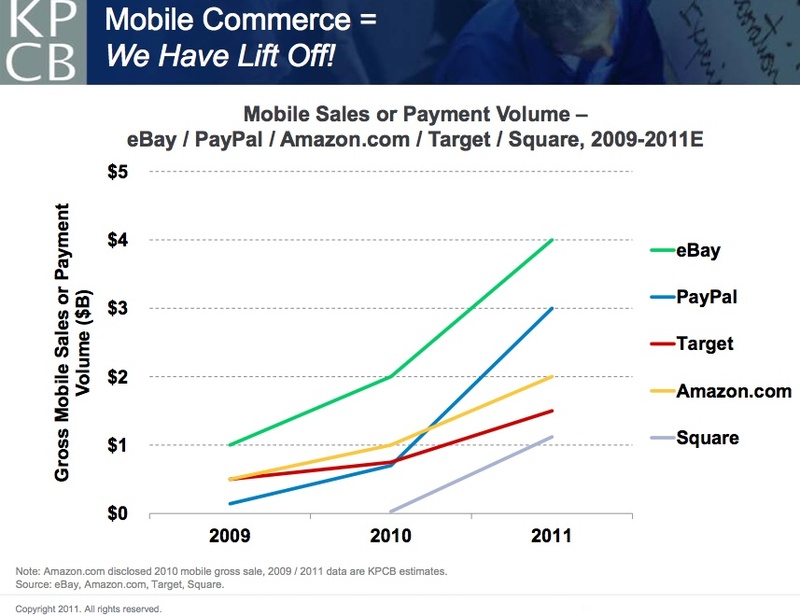 In the mobile commerce/payment field, Mary Meeker shows that while established e-commerce players eBay and Amazon are leading, others like Target are working on their mobile commerce strategies. When it comes to m-commerce, merchandisers must examine the diverse array of products ordered. It’s no longer one size fits all travel and entertainment or leading edge geek technology. 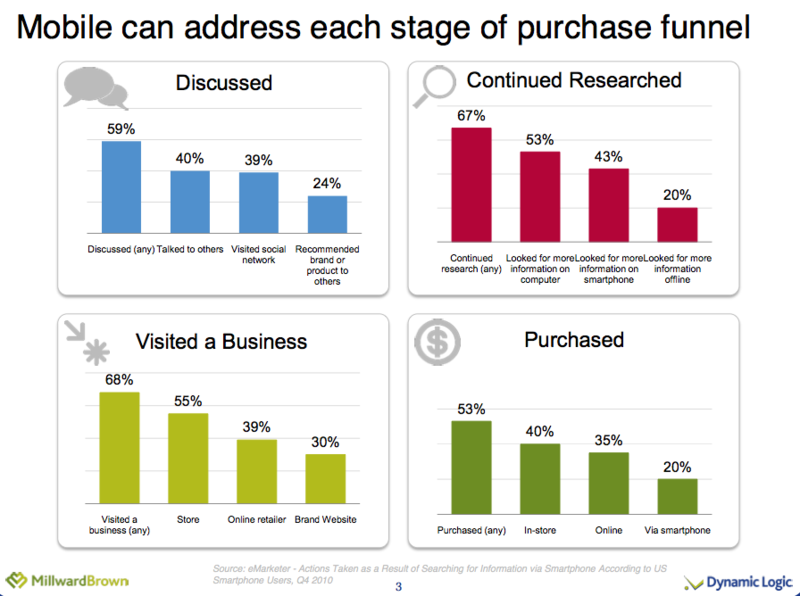 Mobile commerce includes clothing and food based on research from comScore and Millenial Media. 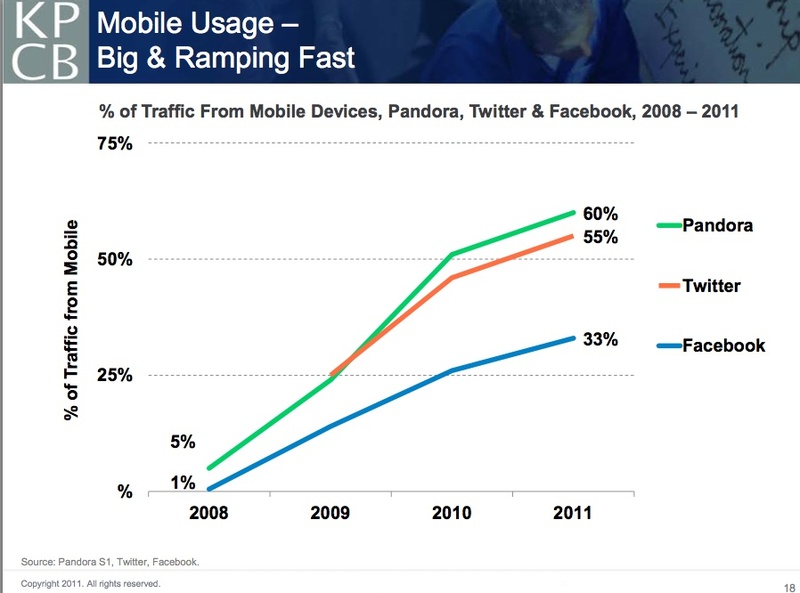 Marketers need to pay attention to the mobile market since smartphones are used all day, everyday. They provide the connective tissue between family, friends and colleagues. Regardless of what else is happening, the mobile phone is always there to provide purchase support and content at a moment’s notice. Shouldn’t it be part of your marketing plans? 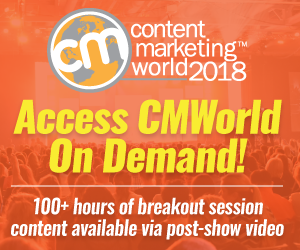 Big tip of my hat to the following for their help and resources: Clark Fredricksen of eMarketer, Max Nelson of Millennial Media, Matthew Hurst of Nielsen, Charlie McAtee of Exact Target, and Sara Beaty of Millward Brown & Dynamic Logic. Here are some other resources that you may find of interest. Mobile Roundup earlier version containing other topics. 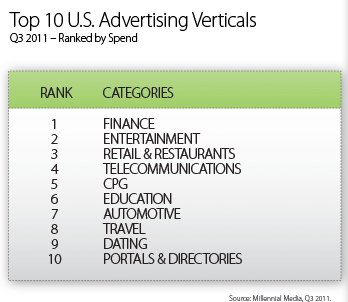 Tags Charts, m-commerce, mobile advertising, mobile commerce, mobile search, Research. Bookmark the permalink.